Color Printed Poster, 28” x 20”, mounted to larger display board, “"Put fighting blood in your business Here's his record! Does he get a job! --Arthur Woods, Assistant to the Secretary of War ...” The poster showing U.S. Marines engaged in battle in France; also shows a badge listing battles in which the Marines fought. 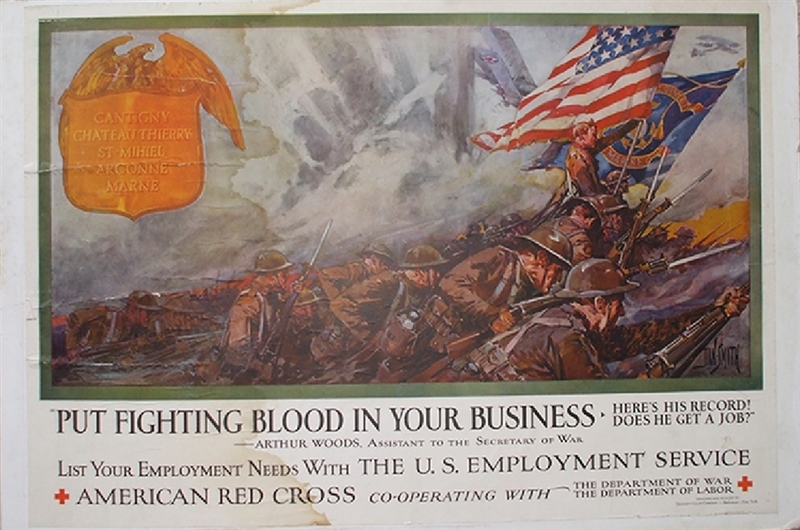 Poster is promoting veterans for employment issued by the American Red Cross co-operating with the Department of War. Designed and printed by Thomsen-Ellis Company, Baltimore.